Everyone is in shock about the explosion., but Barbara still has her sights set on Penguin until she grasps the enormity of the scene and walks away. Jim is helping people who might have survived, orchestrating the recovery process. He blames Penguin for the bombing. Jim decides to use the drinking water to put out the fire. Harvey gives Jim his badge that he gave to the little boy who helped him escape that was found in the rubble. 311 people died.49 injured and 24 missing. He doesn't know who did it and hangs up on the government lady. At the station a mini riot is taking place. They're angry about the bombing and want answers. He assures them that they can't lose hope. He requests help from Lucius to find evidence. Bullock thinks Barbara might be responsible because she disappeared after the building blew. Bruce gets attacked by Jeremiah's men who come at him when he's handcuffed to the elevator gate but Alfred comes to his aid. He sent him a signal! Bruce tells him about Selina and they go looking for her. Jim goes to see Barbara at Sirens. She tells him she didn't kill Penguin because the person who destroyed Haven needs to be stopped and shares information with Jim. She gives him a lead. Penguin goes to the GCPD to tell Jim he's going to help with men and guns and brings a buttload of supplies in to help them out. What is happening?! Ed wakes up again feeling odd and finds a suitcase on his couch. It's empty. He wrote himself a message on on his hand about inmate # something. Penguin, Jim, and team take to the streets to hunt for the bomber. Somebody starts shooting from a building. It's Zsasz. Ed goes to the GCPD file room to look up information. Lucius catches him. He wants Ed's help with determining the explosives and tells him about Haven. If he helps him then Lucious will give him the file he wants. Penguin and Zsasz argue. Jim has a plan to get into the building. Zsasz claims he didn't do the bombing. Jim cuffs him and takes him out. Penguin wants to question Zsasz but Jim says no. Penguin is not happy. Selina follows Harley and gang to a basement where kids are trying to break into somewhere. It's the guy who had the child slaves and Jeremiah kills him. Harley brings him the recruits but he's not happy but he dances with her. She tells him about Selina and Bruce. Lucius takes Ed to Haven where Ed gives his analysis and they bounce ideas off each other.They think someone shot at the oil tanks to cause the blast. Harvey and Jim question Zsasz. Lucius calls Jim and tells him it was an RGB like the one who took down the chopper. This clears Zsasz. Jim tells Penguin and Harvey that Zsasz wasn't responsible. He's intent on taking Zsasz and brings his people in to get him. Penguin is going to hold a trial and le the people decide Zsasz's fate. Ed and Lucius find the building he RGB was shot from. Lucius gives him the file as promised but the inmate is dead. Ed is not happy. 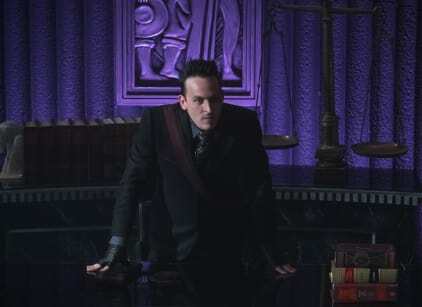 Penguin holds his trial and Jim doesn't interfere because he thinks it would be better than a speech from him. Jim gives his evidence about Zsasz and tells them the truth about help not coming and that it's not justice to kill Zsasz because they're angry. Penguin takes a vote of the crowd and they all find him guilty. Zsasz is taken to the guillotine. Jim stops the execution before it happens and saves Zsasz. Penguin riles up the crowd. Jim and Gordon are at odds again. Jim and Harvey take Zsasz somewhere and release him. Jim orders Harvey to give Zsasz his gun. Zsasz doesn't take it because Jim sees pretty serious and doesn't want to get into a shootout with him. Harvey isn't happy with what Jim did. Bruce and Alfred start taking Jeremiah's people out in the basement on their journey to find Selina. Selina is dressed in Harley's clothes and stabs Jeremiah. Bruce stops her from completely killing him and all three of them are attacked as they try to get out, but they do make it. Jeremiah appears to be dead. Ed goes to the building where he saw the little old lady who might've seen who was on the roof. She tells him that it was HIM who had the rocket!!!!!!!!!!! What?!!!! Then she knocks him out and he remembers what he did as The RIDDLER!!!! It was The Riddler who bombed the Haven. He decides to kill the old woman so she won't tell anybody about what he did. Barbara visits Jim at the station. She has another tip for him about a guy selling RPG's. THEN THEY KISS!